The unfortunate vassals charged with the task of coming up with decent exhibitions to celebrate the diamond jubilee certainly have their work cut out. It’s easy enough to think of shows that will prompt some celebratory aahs and oohs. Throw a dart at Buckingham Palace and you are sure to hit an appropriate subject. But finding one with something to say, something to teach us, is a right royal challenge. So it’s knighthoods all round for those responsible for The Queen: Art and Image, at the National Portrait Gallery — a smart effort at a difficult topic. And a baronetcy at least for whoever came up with The Horse: From Arabia to Royal Ascot, at the British Museum. The NPG’s show is particularly difficult because the Queen has been the subject of so much bad portraiture. The two main problems are blandness and gimmickry. The first is perhaps inevitable. Nobody wants to offend the Queen. Nobody is given enough time to penetrate the practised royal mask. So they resort to the easy ­philatelic equation: crown + gown = Elizabeth II. Even as great an artist as Lucian Freud was unable to tackle her properly, and the result was a rare failure. Worse culprits are those vain royal limners who choose to express themselves with her too creatively. The most pretentious portrait of the Queen in her 60 years at the helm is surely the one produced by Annigoni in 1969, which shows her standing bolt upright in a wilderness, like a Nasa rocket waiting for takeoff in the ­Arizona desert. How sternly Her ­Majesty awaits her launch. How ­cosmically Annigoni positions her in the firmament. The only exceptions to the rule that it is impossible to produce a good ­portrait of the Queen come from the bookends of her reign. At the very beginning, when Cecil Beaton and Dorothy Wilding photographed her in the 1940s, she was a strikingly beautiful princess, the most beautiful of all British royals. Any picture of Her Majesty from her princess years is a record of genuine royal gorgeousness. More recently, when Thomas Struth photographed her sitting with Prince Philip at Windsor Castle, intellectual curiosity was allowed to creep in as well, and the focus could switch from the royal likeness to the impact of the royal ageing process on that likeness. Well done to the National Portrait Gallery for tackling this difficult subject so intelligently. See you in the Tower. Over at the British Museum, the unpromising topic of the horse in art has resulted in one of those displays that you expect to tour in 45 minutes, but actually keeps you glued to the captions for several hours. In my case, it had me coming back the next day, too, for another look at the Assyrian reliefs, the Stubbs and the jockey’s outfit in the royal colours. What a splendid purple that is. It turns out that the horse began life as a donkey. A glorious blue and silver slab, fashioned in Sumeria circa 2600BC out of lapis lazuli inlaid with mother of pearl, the so-called Standard of Ur, shows early four-wheeled chariots being pulled into war by teams of long-eared Sumerian asses. In the most dramatic scene, these fierce donkeys of war trample unfortunate enemy soldiers beneath their hooves. The surrounding paperwork tells us that the horse soon followed the donkey into war, and that the extra horsepower it delivered made it a particularly expensive possession. A set of exciting Assyrian wall reliefs of Ashurnasirpal II riding his chariot over a lion, then being chased by an angry bull, are the earliest ancient artworks I have seen that manage to convey a sense of speed. They were made circa 860BC, and by now the horses pulling the Assyrian king’s chariot have been bred into a familiar equine silhouette that would hardly change between now and the art-nouveau era: flat ears, triangular head, perky tail and a sense of thrust, as if someone is pressing the fast-forward button. The show is divided into three sections. Once the Assyrians had succeeded in breeding the perfect horse to pull their chariots, it was left to the Arabs to perfect the racing horse. Alas, the Islamic portions in the show are thin. Why we need to see several Korans to illustrate the fact that the horse is mentioned in them, I do not know. I suppose the Islamic discomfort with images is once again to blame. Thank goodness earlier Arabic traditions had no such qualms. A series of remarkably detailed photographs of ancient rock art from the Saudi Arabian desert, showing horses inter­acting with ostriches and camels, had me gurgling with joy. The third and busiest section deals with the British love affair with the horse. It turns out that every British thoroughbred is descended from one of three Arabian sires imported at the beginning of the 18th century. British art being British art, most of the resulting winners appear to have had their portraits painted. 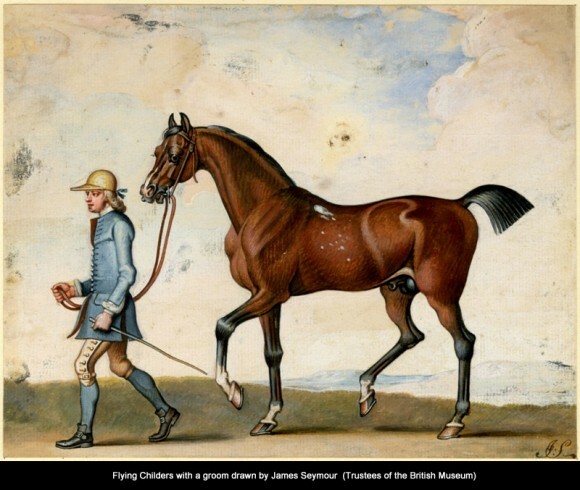 My favourite Stubbs shows Lae­titia, Lady Lade, astride a rearing chestnut. It’s been lent by the Royal Collection itself, and has it all: sensuous horse, sensuous landscape, sensuous woman. Apparently, Lady Lade began her tremendous romantic career as the mistress of a notorious highwaymanknown as “Sixteen String Jack”. Lucky indeed is the horse that got to lay Lady Lade across its back. All the way through the show, I was struck by how the human response to horses seems of a different order from our response to other domesticated animals. The most desirable objects here, the gold models of chariots and horses dug up with the fabulous Oxus treasure in modern Tajikistan, were cult objects employed in mysterious religious circumstances. Meanwhile, at the far end of the display, pictures of our own Queen show her attending her 66th consecutive Royal Ascot. Apparently, she hasn’t missed one since 1945. This is something deeper than admiration. This is worship.